I grew up reading science fiction and fantasy, and I didn’t think anything of it. I love ‘Lord of the Rings.’ I love ‘Harry Potter’ — I love ‘Star Wars’! I hopped on the ‘Star Trek’ bandwagon late in life, I admit, with the new movies, but I loved them as well. I love all that stuff, and there’s absolutely nothing wrong with that. I want people to know: It’s okay to be a nerd! Lee Meriwether is an actress, former model, and the winner of the 1955 Miss America pageant. She is perhaps best known for her role as Betty Jones, Buddy Ebsen's secretary and daughter-in-law in the long-running 1970s crime drama, Barnaby Jones. Evelyn Margatet Ay was Miss America 1954. As Miss Ephrata Fair and Tobacco Queen of Lancaster County in 1950, she wore a crown that looked like tobacco leaves. She was a spokesperson for nash Motors in promoting the first American car that was marketed specifically to women. Colleen Kay Hutchins, Miss America 1952 was the mother of former NBA player Kiki Vandeweghe, and grandmother of 2008 US Open Girls Singles winner Coco Vandeweghe. 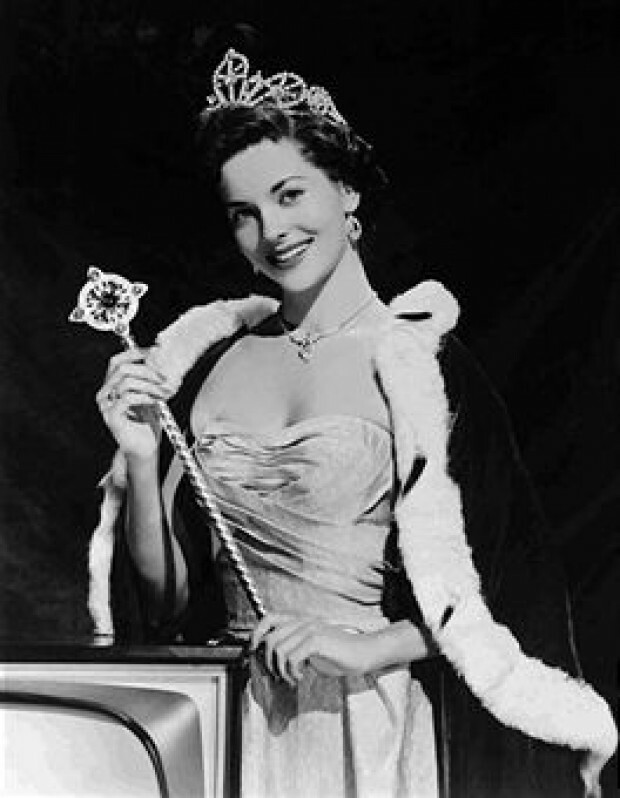 Yolanda Betbeze was Miss America in 1951. Having been educated in a convent school, she was reluctant to pose in a swimsuit and refused to do so after she won Miss America. That led the swim suit company, Catalina, to withdraw their sponsoorship of the Miss America pageant and eventually brought about the creation of the rival Miss USA pageant. Jacque Mercer was Miss America in 1949. She was married and divorced during her reign as Miss America; after this, a rule was enacted which requires Miss America contestants to sign a pledge vowing they have never been married or pregnant. 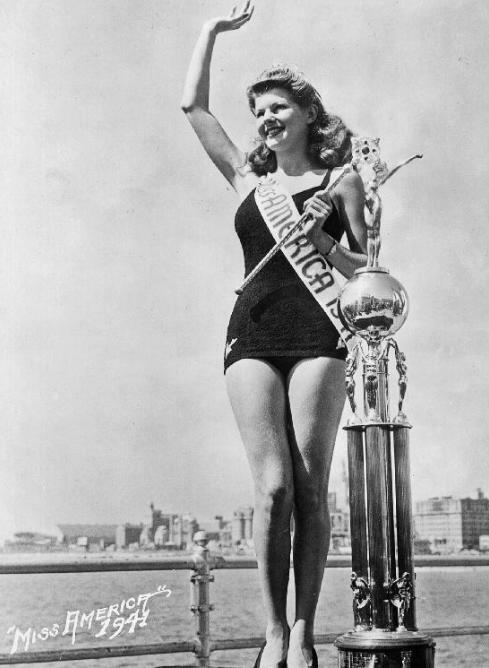 Bebe Shopp was Miss America in 1948. I don't approve of Bikini suits for American girls, Bebe told French interviewers. The French girls can wear them if they want to, but I still don't approve of them on American girls. Barbara Jo Walker was Miss America in 1947. She was the last Miss America to be crowned in her bathing suit; all since 1947 have been crowned in their evening gowns. 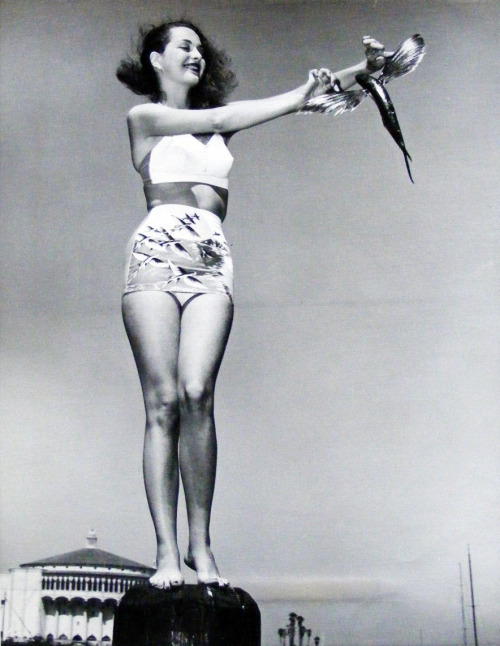 Marilyn Buferd was Miss America in 1946. She appeared in several minor films in the 1950s as well as several foreign language films. Bess Myerson was the first Jewish American and the first Miss New York to win the Miss America pageant. Venus Ramsey became Miss America 1944. She was the first red-haired contestant to win the title. Jean Bartel was Miss America 1943. She won the talent and swimsuit awards at the national pageant. At 5 feet 8 inches tall, Bartel was the tallest pageant winner at the time. 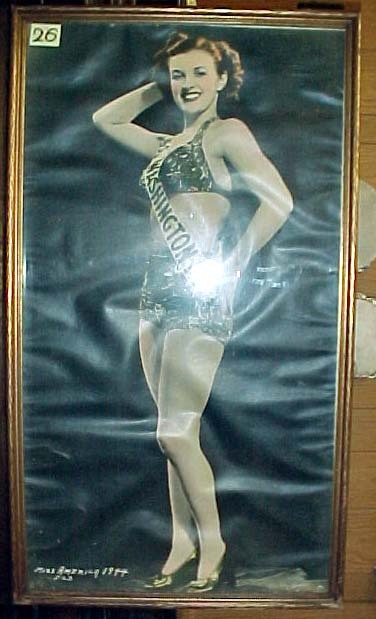 Jo-Carroll Dennison was Miss America 1942. As she was Miss America during WWII, much of her time as Miss America was spent visiting "defense plants, hospitals and service camps" and selling war bonds. Rosemary LaPlanche was Miss America 1941. During her year of service, Rosemary was signed with RKO films, and made over fifty motion pictures in her career. Frances Marie Burke was crowned Miss America at the Boardwalk Hall in Atlantic City on September 7, 1940. She competed in the pageant as Miss Philadelphia. 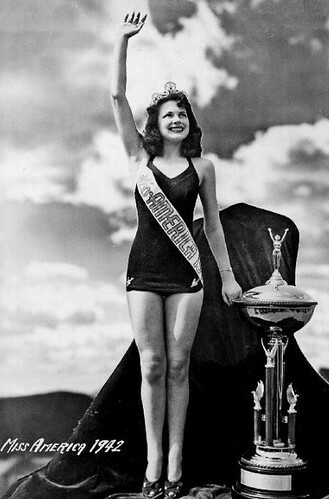 Patricia Donnelly was Miss America in1939. Donnelly was the last to be crowned at the Steel Pier. In 1938, talent became a mandatory category to win the Miss America title, so Marilyn decided to give it a try. Aided by her rhythmic tap dance to three songs ("How'd You Like To Love Me", "The World Is Waiting For The Sunrise" and "Joseph, Joseph"), Marilyn was crowned Miss America 1938 by Atlantic City Mayor A.C. White in the Steel Pier's Marine Ballroom. Bette Cooper won the 1937 Miss America Pageant as Miss Bertrand Island, representing an amusement park on Lake Hopatcong, New Jersey. She is best known for abdicating her throne, declining to make appearances and returning to school. Rose Coyle was Miss America in 1936. Coyle was the first to receive an encore in the talent completion. Henrietta Leaver Miss Pittsburgh, was crowned Miss America on September 7, 1935. She was 19 years old. Marian Bergeron was Miss America in 1933. She is the youngest Miss America in history, winning the crown at the age of 15½. She held the title for two years since no competition was held in 1934. Lois Delander was Miss America in 1927. She was one of the most famous models appearing in the Gerlach Barkloe Co. art calendars. A pastel of Lois Delander wearing a white bathing suit was artist Adelaide Hiebel most famous work. 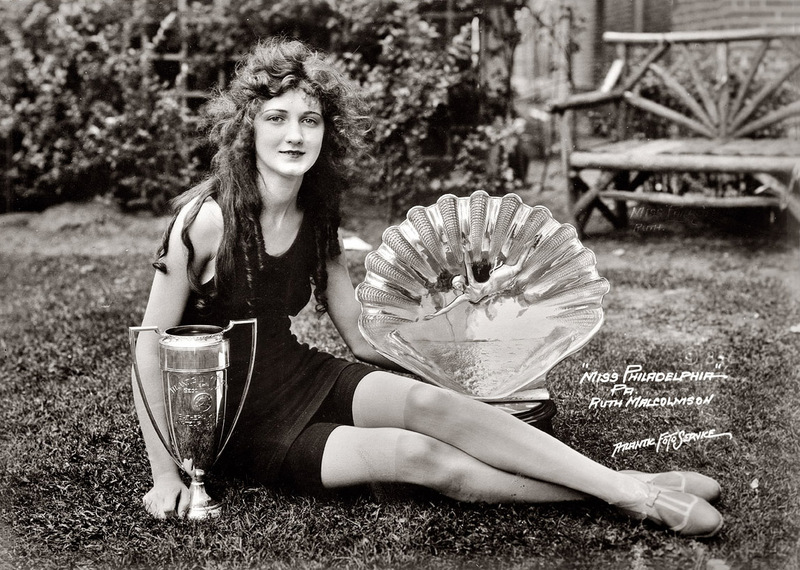 Norma Descygne Smallwood captured first place in both the bather's review and the evening gown contest and the following evening was crowned Miss America 1926. Smallwood is noted as being the first Native American to win the crown. It was a fluky thing, but much to my surprise I won..They gave me a Rickenbacker car . . . and when I came home from Atlantic City after winning, there was a ferry boat waiting to bring me across the river from Camden. 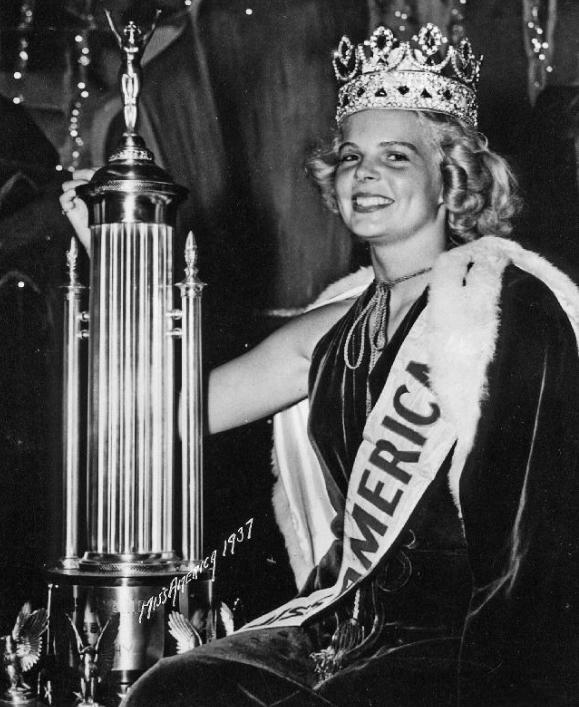 Mary Katherine Campbell was the only person to win the Miss America pageant twice, and the second woman in history to win the title. 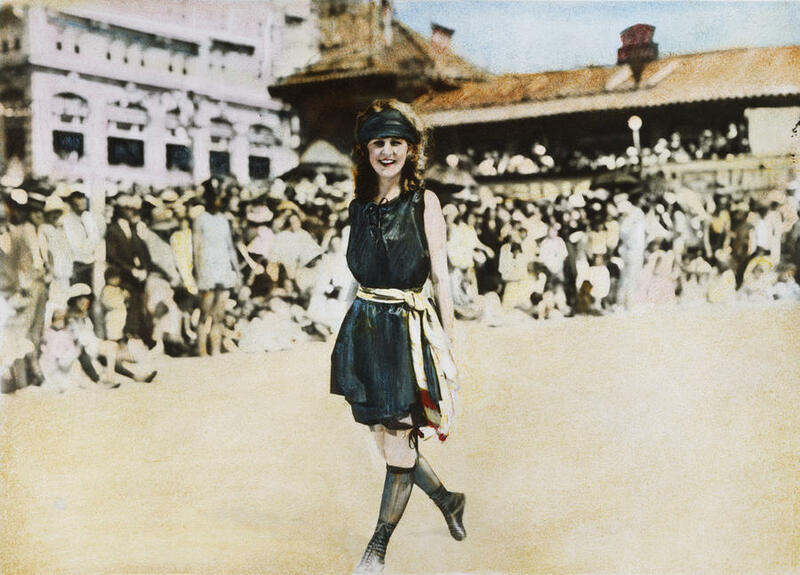 Campbell was Miss America 1922 and Miss America 1923, and she was also First Runner Up at the 1924 Miss America Pageant. I never cared to be Miss America. It wasn't my idea. I am so bored by it all. I really want to forget the whole thing.